Fermented radish pickles are delicious and full of probiotic health benefits. They're great made with other types of radish, too. But when you make them with watermelon radishes (a variety of radish with intensely pink flesh), the results are also colorful enough to kickstart party conversation. Stir the salt into the filtered water until it is completely dissolved. It's important to use filtered water because the chlorine and other chemicals in most municipal tap water can interfere with the fermentation process. 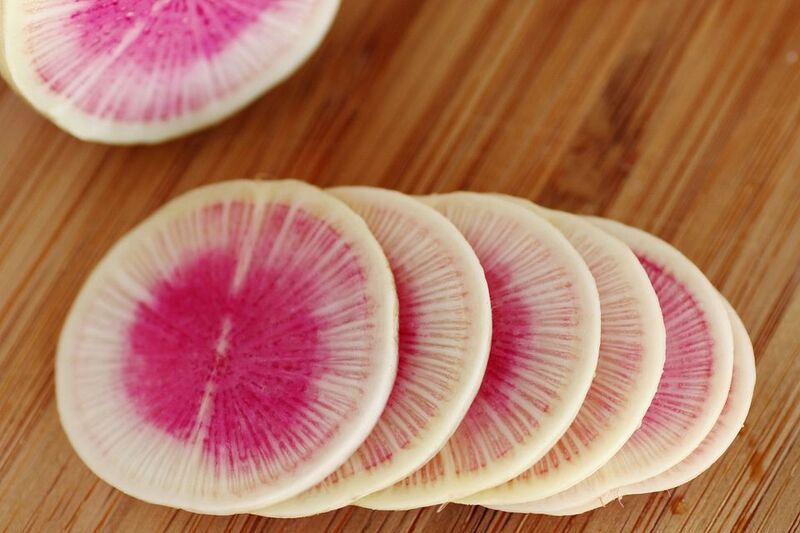 Slice off the leaf and root ends of the watermelon radishes. Julienne them into matchstick sized pieces, or slice into 1/8-inch thick crescents or rounds. A mandoline or the thin slicing blade of a food processor will make this step easier. In a large bowl, toss the watermelon radish pieces, sliced onion, garlic and red pepper flakes (if using). Pack them into a clean pint glass jar. It is not necessary to use a canning jar for fermented foods: any clean glass jar will do. The brine should completely cover the other ingredients. If the food floats out of the brine, weight it with a smaller glass jar filled with water. If the vegetables are staying immersed in the brine, just cover the jar they are in loosely with a lid. Do not screw the lid on tightly because you want the gasses that develop during fermentation to be able to escape. Place the jar on a small plate to catch the overflow that is likely to happen as it starts to ferment. Leave it at room temperature for 24 - 48 hours. Fermented watermelon radishes are ready to eat 1 - 2 weeks after you make them. If you plan to store them for longer than a month, move the jar to a cooler part of your refrigerator (one of the central shelves rather than the inside of the refrigerator door). Note: If salt isn't an option for you, you can use the alternate method for lacto-fermentation without salt.